Are you wishing you could go back in time? 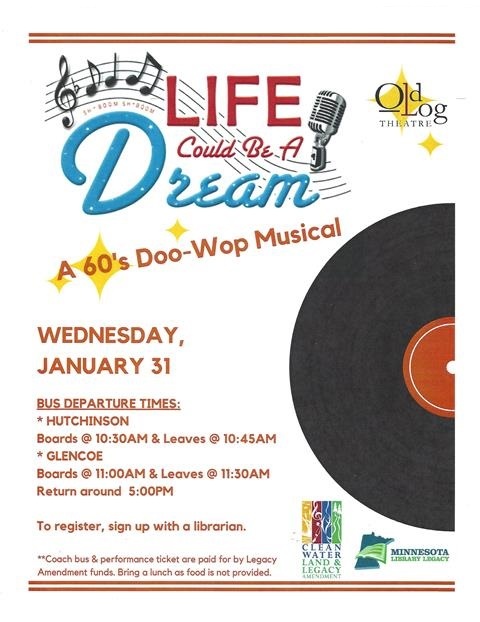 Come join us on Wednesday, January 31st for a bus trip down to the Old Log Theatre and Doo-Wop your day away! Your trip back to the ’60’s is free–all you have to do is bring a lunch. Take a trip to Springfield and meet Denny and the Dreamers, a fledgling doo-wop singing group preparing to enter the Big Whopper Radio contest to realize their dreams of making it to the big time! Trouble comes in the form of Lois, who arrives to put some polish on the boys. Denny falls in love, Wally falls in line, Eugene falls apart, and along comes handsome heartthrob Skip to send the whole situation spinning. Hear hit songs like: Fools Fall in Love, Tears on My Pillow, Runaround Sue, Earth Angel, Stay, Unchained Melody, and of course, Life Could Be a Dream. Winner of the Los Angeles Drama Critics Circle Best Musical Award, Life Could Be a Dream will leave you laughing, singing, and cheering! Winsted has 4 spots left, so don’t wait–call us today at 320-485-3909 to reserve your seat. The bus leaves from Hutchinson at 10:45am or Glencoe at 11:30am, and returns around 5:00pm. Please arrive 15 minutes early for check in and boarding. « Winter Reading is SNOW MUCH FUN!